Aliko Dangote is the World’s richest black billionaire with an estimated net worth of $16.6 billion. He was 2014 Forbes 23rd richest person in the world and Africa Person of the Year. As the number of African billionaires grows from 9 to 11, none has come close to unseating Dangote from the top spot, a position he has occupied for over 6 years now. Dangote made it to the billionaire’s club in 2008 with a net worth of $3.3 billion, and in 2013, displacing Mohammed Hussein Al Amoudi as the richest black with a margin of $2.6 billion. Dangote is the current richest black billionaire in the world, the richest in Africa and West Africa. The Nigerian business mogul was born 10 April 1957 into a wealthy Muslim family and he hails from Kano, the second largest city in Nigeria and an age-old business centre. In the footsteps of his legendary business tycoon grandfather, Alhasssan Dantata, Dangote experimented with trading at a very tender age – selling sweets as a matter of interest – and as he grew older, he ventured into business with a more vivid intention. His first business funding came from his millionaire maternal uncles, the Dantata’s. From the ordinary local trading merchandise that it was in 1977, his enterprise grew into a multinational conglomerate of over 13 companies with a commendable distribution network, a proof of an apprenticeship well spent with his maternal relations. Today, Dangote is the CEO and founder of the Dangote Group of industries with diversified interests in imports & exports, manufacturing and investments in food/consumer goods. The Dangote Group is present in 15 African countries including Nigeria, Benin, Cameroon, Ghana, South Africa, Togo, Tanzania and Zambia. Dangote Group is the largest chain of companies in West Africa, with a sugar refinery which is Africa’s largest and the third largest in the world producing an annual 800,000 tonnes of sugar. The Dangote Cement is the largest manufacturer of cement in Africa with a $15 billion market capitalization. It produces 44 million metric tons annually and plans to increase its output 33% by 2020; the subsidiary as at 2013, has assets worth ₦843 billion ($4.2 billion) and a revenue of ₦386 billion ($1.9 billion). Most recently, the business tycoon resigned from the board of Dangote Flour Mills, following the withdrawal of Tiger Brands from funding the subsidiary. Dangote Conglomerate is further birthing more subsidiary companies across Africa, employing over 11,000 workers. In a very huge and significant way, Dangote has been tremendously helpful in the areas of employment and economic growth in Nigeria, a saviour to the Nigerian economy. Dangote presides over the Nigerian Stock Exchange in which he owns a 20% stake of the total market capitalization. He has served in various political capacities in alliance with the Nigerian government and officially conferred the second highest honorary title of GCON – Grand Commander of the Order of the Niger. 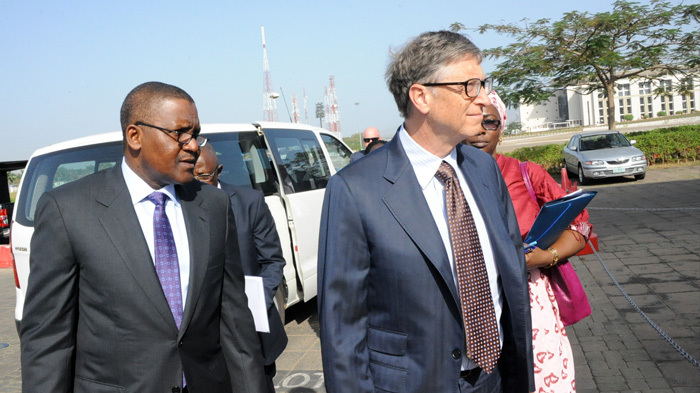 In 2014, Aliko Dangote supported the nation’s fight against Ebola with a ₦150 million ($750, 000) donation. Despite being a victim of the Nigerian currency inflation, the most successful non-oil investor in Nigeria persists in the call to national support and philanthropy. He is the serving as chairman of The Dangote Foundation – which focuses on education, agriculture and health-related initiatives. Dangote is also building an oil refinery that will be completed in 2019. The refinery is expected to produce 650,000 barrels per day of refined petroleum products to meet all the country’s refined petroleum products needs and reduce her dependence on oil imports as the $11 billion refinery holds the prospect of doing so. In January 2017, he announced plans to establish a $100 million truck manufacturing facility in Lagos in partnership with SINOTRUK, a Chinese firm. Dangote strongly believes the Nigerian economy will be ultimately salvaged through patriotic investments, thus, he has investments in the lucrative sectors of the Nigerian market- real estate, banking, transport, textiles and recently in oil and gas; gradually he is also delving into telecommunications. As a keen and hardworking business tycoon, Dangote still has intentions of establishing a couple of multi-billion dollar manufacturing plants and import terminals across Africa.